Men’s relationship to shopping was once limited to waiting outside changing rooms, parroting, “That one’s nice,” while enduring Geneva Convention-flouting concentrations of ‘Spice Up Your Life’. Now, menswear is fashion’s fastest-growing sector and designers no longer relegate us to holding the bags. But consumer confidence doesn’t always equate to execution and, as brands grow bold, what’s sent down runways each season grows tougher to integrate into your wardrobe. But with baby steps, even the most out-there looks can soon become second nature. It’s time to level up your outfits. Menswear is relaxing. A welcome reaction to the super-skinny silhouettes of recent years, everything from sweatshirts to overcoats now come in looser silhouettes. The change is most drastic below the belt, with designers from E. Tautz to Topman Design and Christopher Raeburn showcasing billowing trousers at LC:M. But the bigger your trousers, the bigger the risk of looking like you’re playing dress-up in your dad’s wardrobe. Unlike the typically more cropped hem of a slimmer leg, wide trousers should be worn longer and be cut from a heavier cloth – like wool-flannel or wool-hopsack – to weigh the fabric down and gather on your shoes. Pendulums belong in grandfather clocks, not your outfit. Our Legacy Wide-Leg Wool-Hopsack Trousers, available at Mr Porter, priced £170. Mesh has been rescued from Ibiza’s podiums by designers like Christopher Raeburn, who reclaimed military fabrics and technical clothing into pieces where its function is about more than flashing skin. Which turns mesh masculine, providing you cherry-pick the best bits. Even subtle mesh is bold, so neutrals are most appropriate; olive green, black, camel or navy are easy to wear and reference the fabric’s military heritage. Which also helps up its butchness. Religion Perforated Zip-Up Tracksuit Top, available at ASOS, priced £80. Fur has ethical hang-ups as unappealing as its price tag. Fortunately, faux fur is a stylish (and guilt free) alternative. Which is why it’s enjoyed a resurgence of late, with many designers opting for man-made substitutes over risking PETA’s wrath. The runways have seen some bold renditions, not least the patchwork faux fur and shearling coat spotted at Topman Design’s June LC:M show. If you possess the cojones for such a provocative ensemble then bravo, but know that there’s a very fine line between gentry and Bond villain. “Touches of faux fur can inject a little luxury into the simplest winter ensemble, so there’s no need to go overboard,” says Tang. “A faux fur lapel on a pea coat, the lining of gloves, or a trim on a winter hat will be impactful enough.” And prevent people quizzing you as to where the hoes are at. 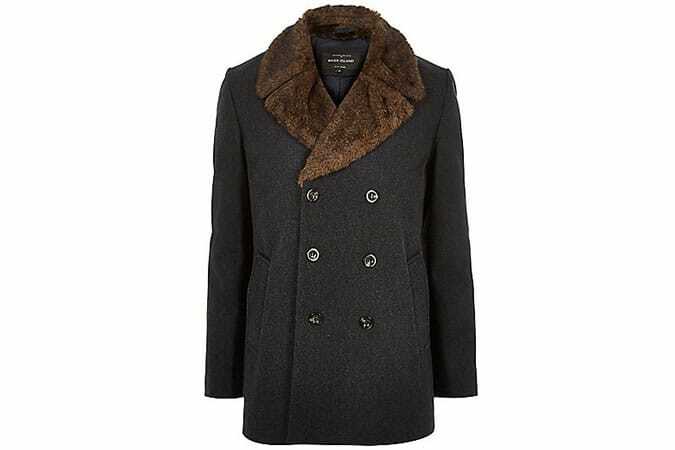 Dark Grey Double-Breasted Winter Pea Coat, available at River Island, priced £95. Perhaps in rebellion against the drab fare of previous seasons, colour is back. And we’re not talking a bottle green fleck in your pocket square either. Instead, think blocks of scarlet, cobalt, even – gulp – pink. To most men, the suggestion of wearing anything other than black, navy, or grey in winter is laughable. We’ve all toyed with the idea of experimenting with colour, until a voice of doubt screams “Hot pink? Are you insane?” And understandably so, since brights wash out your skin and are harder to pair than geriatric pandas. But it can be done. “There’s no escaping the fact that you’re wearing a bold colour, so embrace it,” says Tang. “Don’t coyly wear a bright orange bracelet with an otherwise dark outfit. Choose one statement piece and build your outfit around that.” A block-colour knit will pop against dark trousers, so long as you keep your footwear simple. One rebellion at a time, please. 100% Cashmere V-Neck Sweater in Yellow, available at Uniqlo, priced £89.90.